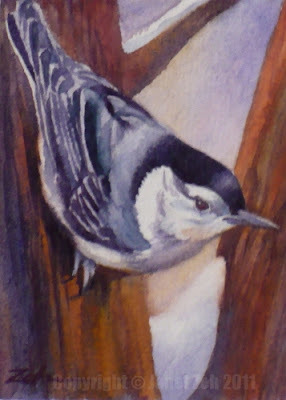 Continuing the watercolor bird series, here we have a little nuthatch on a snowy tree. Nuthatches run up and down trees looking for insects in the bark with their strong woodpecker-like bills. They are interesting birds because they will go down the tree headfirst, have you noticed this? They'll also eat seeds, so they do visit feeders. There are three varieties in North America. In New England, we have the white-breasted bird pictured here and also the smaller red-breasted nuthatch. If you live in the Southeast U.S., you may have seen the brown-headed nuthatch. Thanks for stopping by. Hope you have a lovely day! This painting and the display are beautiful. 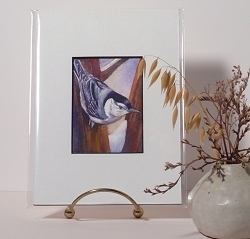 I am enjoying seeing additions to your bird series daily. They are wonderful. Thank you for letting me know you like the series, Viki. It's always great to know someone is enjoying the posts. If you have any birds you especially like, let me know. I'm always looking for ideas!